Barbers gain their popularity. Due to this fact, we think that it’s necessary to create a special listing for barber flyers. This category will be very useful for all barbershop owners. 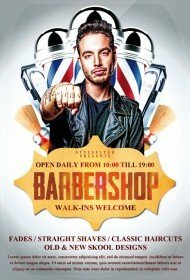 Barber flyer category include only unique premium barber flyers templates with well-organized structure and creative design. Here you will find a creative and bright barber flyer templates for your promotion campaign. We offer you only printable flyers at reasonable price. Buy barber flyer template just for $2.49 and make any customizations with any sample. You can bright to it your unique style and ideas. If you want to change some parts but you don’t know where to start you can hire us and we will provide you will quick and efficient assistance online. 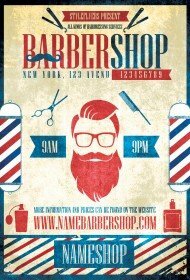 Don’t forget to add all critical information about your barbershop and its offers. 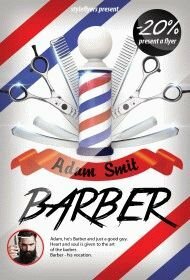 It’s very important to make your barber flyer both creative and informative. 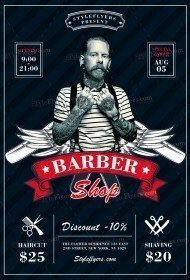 If you buy barber flyer PSD templates you will decide in favor of reasonable price, high quality and reliable assistance. 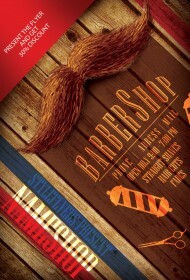 All our client will get a free Facebook cover with their barber flyers. You can also make any changes with it and make your Facebook promotion event more efficient. It’s your opportunity to create the most effective and affordable promotion campaign. All Photoshop files are available for sale.